"We will work with [other scientists]. We will provide them with samples. But if you ask my personal opinion, it's a crazy idea to clone the mammoth." In the October 1999, Siberia became the focal point of an important find in the world of science. The complete remains of an ancient wooly mammoth were discovered frozen in a block of permafrost, something extraordinarily rare in the field of paleontology. The huge effort by scientists to take the block out from the Siberian tundra were chronicled in the Discovery film Raising The Mammoth. Now, we have the 'sequel' of sorts, in the form of Land Of The Mammoth, continuing the story of the mammoth (known as the Jarkov Mammoth) and the scientists who seek to understand the prehistoric world through his remains. After being removed from the tundra, the Jarkov Mammoth was stored in a cave beneath a small Siberian town, above the Arctic circle. For a over a year, the horrible weather in this area prevented scientists from actually spending much time studying the mammoth carcass. As this documentary begins, the warmer season of 2000 is starting in Siberia, which means researchers can begin their work. The program follows the work of researcher Bernard Buigues, as he divides his time between the Jarkov Mammoth and leading a team into the Siberian Taimyr Peninsula to search for more mammoth remains. The reason behind all this work is to solve something of a prehistoric mystery. Wooly animals, such as mammoths, rhinos, and oxen, existed alongside humans at one point. Suddenly, however (in terms of the geographic history of the Earth), Wooly species died off the face of the planet. No one really knows why, although there are theories. Scientists want to know specifics, and these mammoth carcasses are an excellent place to start. What makes the Jarkov Mammoth so special is that it is a complete animal, not just fragments of bone. Even traces of hair and skin are left. The paleontologists use forensic science to try and understand the world that the mammoth lived in by examining things like frozen pollen and plant life inside the permafrost block. While the documentary is excellent in terms of its subject matter, I won't mislead you: not a whole lot happens in this program. Discovery Channel hyped up this event a little too much, in my opinion. I think they led people to believe that the mammoth would be unveiled and exposed to the world, and it is not. Instead, we have a good look at the scientific process of slowly thawing the block the mammoth is housed in, and studying every square inch of soot. The process could take years and we probably won't see the Jarkov for some time. This doesn't lessen the substance of the show, but it is a factor that needs to be taken into consideration. Of course, some people have pointed out that it didn't take this long for other finds to be properly exposed or researched. In the case of the Jarkov Mammoth, the team wants to use a slower, more thorough approach that studies everything, not just blasting out the carcass with hot water. For anyone interested in this find, though, it's still a fascinating experience. Imagine being able to pet the hair of a mammoth; hair that hasn't been exposed to the world in over 20,000 years. Adding to the amazement of the find is also the fact that the tusks are totally intact, with one scientist even breaking into tears over having to cut a piece out for special study. It's obvious these people have a certain amount of reverence for what they're doing, and in a sense, it's required. They are reaching into the past and attempting to contact the spirits of these dead animals, hoping they'll communicate something of their lives to us here in the future. Hopefully, some time in the near future, Bernard Buigues and his team will be able to get deeper into the Jarkov Mammoth's frozen prison and we'll be able to see the complete remains of this majestic ancient animal. Will life imitate art like Jurassic Park? Will someone attempt to take DNA from the mammoth and clone one? Only time will tell, but if it came true, the Jarkov would be the first animal to 'father' a child 20,000 years after his death. Part of the program is dedicated to using computer graphics to create a vision of what the mammoth's world may have looked like; populated with other prehistoric fauna. The footage is a mixture of real backgrounds with CG models placed in. I have to admit, I was a bit disappointed here. After some of Discovery's presentations (especially the BBC-produced Walking With Dinosaurs), this computer generated world fell far short of my expectations. It just didn't look terribly real, but it still has value as a vision of the life and times on the Taimyr Peninsula. 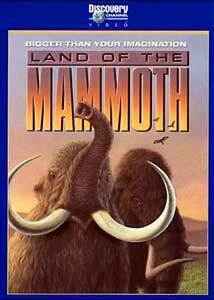 Land of The Mammoth feels like it's the second part of a three part trilogy, the third part being the final task of focusing on digging out the mammoth and revealing the body. What is unknown at this point is what state the animal is in. It may very well have rotted before being frozen, or it might be preserved. Either way, I'll be hoping to see the final conclusion to this scientific quest when it comes. For now, this excellent documentary will have to suffice. Image Transfer Review: Originally filmed for High Definition presentation, Land of The Mammoth has astoundingly good image quality, without flaws in any way. Brilliant color, crispness, and sharp picture are immediately apparent, with no signs of artifacts, pixelation, or source damage. Most breathtaking is the level of clear detail in textures. This is a reference quality disc, no question. Audio Transfer Review: While I expected the Dolby Digital 5.1 mix to be kind of weak for something like a documentary, I was pleasantly impressed by how well the mix was engineered. There is a total ambience to the documentary, in almost every scene. If the scientists are in the ice cave, the acoustics are geared to the cave (complete with sound echoes), if they're on the windswept tundra, the surrounds are used for wind effect, and the audio is spatialized throught he entire system as if you were there yourself. The computer generated sequences (in which we see some speculation about mammoth life) use the same technique, with a few split surround effects here and there. My only complaint is that the LFE channel is heavily used (for mammoth stompings and other effects), but it is not balanced by material sent to the other speakers, which means the low bass effects stand out in a very obvious way. In other words, the rest of the speakers are not sent much bass information at all. This is minor, though. The 2.0 Surround audio is very good as well, just not as broad and immersive as the 5.1. The same kinds of stereo and surround effects are present, simply downmixed for the 2.0 format. Return to the Tundra journal. Extras Review: Totally unadvertised on the case, there is actually a commentary on the disc featuring most of the production staff behind the documentary. Unlike most commentaries, this one just kicks in from the very first second of the program with no pleasantries. Unfortunately, since there's no introductions or special subtitles, you never quite know who's talking, but you can kind of figure it out depending on their field of expertise. It is a good track, though, if you want to know more about how the project got off the ground as well as a pressures of creating such a highly anticipated "documentary sequel." The "making-of" featurettes are merely a set of short promotional clips (done as commercial break pieces for Discovery Channel) with a few aspects of the the documentary's production. They aren't very good or incisive, but they are better than having no information. The Return To The Tundra journal is a readable diary of events from the Taimyr Peninsula expeditions. It is, however, unclear exactly whose point of view the journal is supposed to be from. I suppose it's debatable whether or not these are genuine journal entries, but they make an interesting read. The original promotional trailer for the show as well as a weblink are the final extras. Oddly enough, for an educational program, there are no subtitles. Land Of The Mammoth is a great follow-up to Raising The Mammoth. If you're a fan of these scientific sagas, this is a definite purchase.